Good morning, August ended with corn up 12 ¼ (Dec) and beans up 12 (Nov). Oversold conditions, strong export sales (32 mln bu), and the potential the USDA might lower yields lent support to corn yesterday. Additionally, hurricane Harvey shut down one of the country’s largest refineries, causing gasoline prices to rally – adding support to our ethanol / corn space. FCStone raised their yield estimates from 162.8 bpa to 166.9 bpa and Informa will release their estimates today – in August, Informa projected 165.9 bpa. The U.S. dollar weakened, the Brazilian real firmed, funds covered their shorts, and export numbers came in on the high end of expectations giving support to the bean market, yesterday. 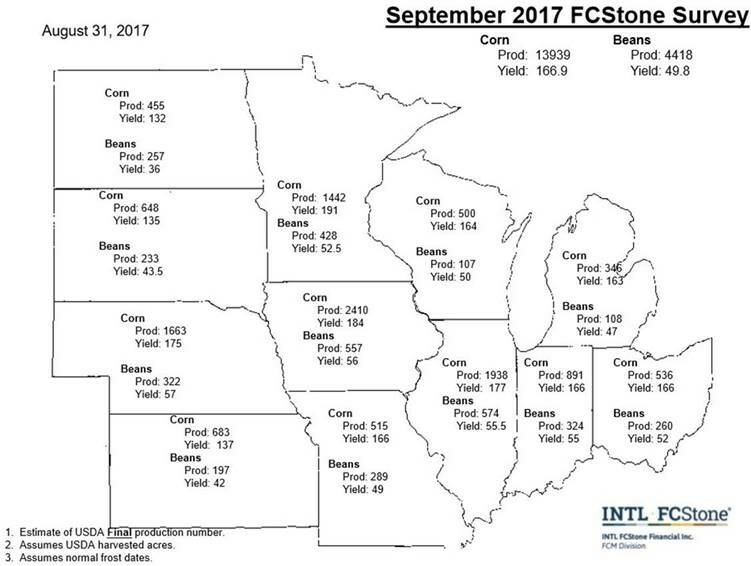 FCStone’s yield estimates on the beans were increased from 47.7 bpa to 49.8 bpa. This is the time of year the market starts mulling over frost in the northern states. Hope everyone has a happy and safe Labor Day Weekend!